Climate models vs. climate data: A THOUGHT EXPERIMENT | Watts Up With That? Is it true that energy from either an outside source or an increase in insulation will warm a system according to or in proportion to its residence time in that system? If true, this might explain why changes in GHG concentrations appear to have less affect on global temperatures than similar changes in solar forcing. 1. It is not contested that a black box that absorbs solar energy more efficiently will be warmer inside than a white box with a reflective surface. Is the reason for this that the solar energy has a much shorter residence time in the reflective white box than it does in the black box? 2. If we imagine a change in solar activity that adds 1 W/M2 of energy to the earth system. Some of this energy is deposited directly into the atmosphere and land surface where it is returned relatively quickly to space. A large portion of this energy is, however, deposited directly and by radiation into the oceans. This energy can remain circulating in the oceans for many years sometimes up to 1000s of years. It has an extremely long residence time. 3. Now, can we imagine a similar change in GHG concentration that adds similarly 1 W/M2 to the earth system. These extra GHGs largely and initially affect the atmosphere as they add to the earth’s radiative emission height to space. The water vapour feedback mechanism also works largely in this way. This higher average emission height warms the earth system initially high in the tropical troposphere and by convection the whole atmosphere is warmed. This energy is returned to space relatively quickly. This warmer atmosphere then insulates the oceans and the oceans become warmer as a result. The energy that is trapped this way in the ocean has an extremely long residence time in the earth system. GHGs do not warm the oceans significantly by radiation. 4. The mechanisms by which a change in GHG concentration and a change in solar activity affect the earth’s surface temperature and heat content are very different with the residence time of the GHG energy likely to be significantly shorter than the residence time of the extra solar energy. If this is true, then the efficacy of a GHG forcing would be significantly lower than the efficacy of a similar solar forcing. 5. Nearly all sensitivity studies base their feedbacks on the assumption that GHG and solar efficacy are approximately equal. The IPCC states this in their reports. The feedbacks used are then feedbacks to an initial warming while feedbacks related to the intrinsic nature of the forcing and its mechanism are not normally considered. In particular, changes in residence times for energy from the different forcings do not appear to be considered. 6. If we give solar activity changes 4 times the efficacy of GHG changes then the Energy Balance Model below can be produced. It is not a bad match with the actual measured temperature and indicates that sensitivity studies should not assume that these efficacies are similar. 7. The model below uses Aerosols, Solar and GHG forcing only and has a reasonable internal variability included based on the PDO and AMO indexes. The change in equilibrium temperature for 1 W/M2 of solar change was 1.4C while a similar change in GHG forcing was assumed to produce about 0.35C of warming at equilibrium or about 1.3C for CO2 doubling. Aerosol forcing is at the lower end of the IPCC range. The differences from 1980 to 2000 may be due to volcanic activity not being included. 8. The higher solar sensitivity fits well with millennial temperature and solar forcing estimates. The variation in millennial temperatures can only be explained by higher solar sensitivity. 9. This Energy Balance Model certainly is a curve fitting exercise, but it does produce the cooling period from 1940 to 1970 and the current temperature hiatus and should be taken into consideration for these reasons. June 1, 2018 in Climate data, Climate Models. ← Is the Earth Becoming Dangerously Warmer? What does residence time of energy even mean? How do you track it? A quality of insulation is residence time of joules. Compare to a conduit. “residence time of energy”, … yeah, I’m with you on that one — what does it even mean? How does one track energy that is moving about and changing from one form to another? How does energy maintain a unique identity that even allows it to be tracked as that original identity? This is CAGW, Nick. There is no heat. Only smoke and mirrors. Enters as a photon from the sun, leaves as a photon of IR. Imprecise, but we’re dealing with climate science, imprecise is expected. Imprecise? There is no way of measuring a time at all. But the units in the post are in power flux – W/m2 – not energy. If the steady state power flux increases as presumed in the post, energy is absorbed and temperature rises to a new equilibrium. The question of “how long” the energy stays in the system may be relevant to the response time it takes to achieve the new temperature at equilibrium, but it shouldn’t at all be relevant to what the new equilibrium temperature is, given the higher power flux. Actually you can measure the time and the equilibrium just there aren’t any climate scientists or commentators on here who have enough physics background to think you could do it or what they are trying to do. Strangely since last year science is also probably in the position you could do the experiment. So lets let the cat out of the bag you are dealing with quantum mechanics not the stupidity of classical physics. There are other neat experiments that you could do tell you a great many interesting things about the Radiative Transfer process of the atmosphere. The problem is the science types that have moved into Climate Science and for most it has never been about science. There are a great many answers in climate science that could actually be answered if you actually got some with the right background involved. The problem would be convincing any with the right background to work in the political and toxic field. So how do you get a residence time out of this? Or what sort of residence time? A marked photon, if you could do it, would give a time of microseconds. No Nick a marked photon won’t give a time in microseconds, it will give a time in whatever happens to the photon. If a photon is photosynthesized it ends the entanglement ends up in the leaf and we measure it there., that experiment has been done .. do some reading. So to answer you question I need to know what target you are going to strike with the photon and then you will also have a launched photon count to detected photon count so you would know how many did something weird along the way like got reflected, re-radiated etc. I suspect what this post author is intending to discuss is something more like absorption characteristics. I feel as confused as you are, Nick. This isn’t a physics-based approach to the problem. It’s true that the more exposure a source of energy (ie, photon), has to a medium (say, and absorbing gas), the higher the cross section for absorption. But typically that is measured as ‘mean free path’ or some other relevant description. With light, in particular, a mean free path could be expressed as a ‘mean free time’ due to the nearly-constant speed of light. But it still doesn’t really make sense. For example, if I put a hot rock into a small bath of cold water, the water will be heated by the proximity of the rock while the two objects establish thermal equilibrium. After that, the rock could be in the bath, or not, and wouldn’t affect the temperature of the bath regardless of exposure time. But that kind of bean-counting is completely irrelevant. If the Earth absorbs one photon through, say photosynthesis, but then releases another – different – photon to shed the extra energy to maintain equilibrium, the result is the same. Any change in the Earth’s temperature by definition only represents a change in the total heat (energy) stored in the Earth. That’s it. The in-and-out exchange of energy at the system periphery, and thus any change in the Earth’s temperature, is indifferent to the residence time of any individual quantum of energy within the system. You have taken one specific example, as I said to Nick it’s like the statement “We intend to limit global temperature rise to 2 degree” it only has meaning when you define what you mean and it requires a lot of explaining. It doesn’t take any kind of detailed knowledge of quantum physics to understand that the author’s units are off. It makes no sense at all to be speaking of a “residence time” of an indefinitely-long power increase into a system, because the input is measured in energy per second. Trying to account for individual bits of heat as they move around in the system and finally leave is pointless; it just doesn’t matter. Don’t be ridiculous there isn’t an indefinitely long power build up, you are acting as if there are no feedback mechanisms. If you want to go down that path you have units of power input then you have power loss in those same units and over the same time. The complication is the power coming back out may lag and therefore it has a residency time or you can call it a thermal lag factor or thermal lag time or any other term that is essentially describing the same thing. There are no real standards for this stuff because you are dealing with a complex situation you have to make definitions that work for what you are discussing. Read what I said more carefully. I never said there was an indefinitely-long “build up.” I said that the step up in power input from adding any incremental amount of greenhouse gasses lasts an indefinitely-long period of time. If we double the amount of CO2 in the atmosphere, that is going to cause a constant increase the amount of power input into the climate system, which is going to last indefinitely until GHG concentrations drop. You can quibble about what amount in W/m2 is attributed to a doubling in CO2 due to any feedback effects. You can rationally question much of a temperature increase is necessary for the climate system to adjust to the new increase in power input, so that the power output matches it (equilibrium). What you cannot rationally do is argue that doubling CO2 amounts to some kind of temporary shot of energy into the climate system that somehow gets discarded once it works its way through the system and exits back into space, and that the equilibrium temperature depends on just how long that time takes. Increasing the value of the W/m2 into the climate is not an impulse function, it’s a step function. The climate system is going to have a change in equilibrium temperature to match the increase in power input. What that equilibrium temperature happens to be, is in no way dependent on any “residence time” of any of the additional energy input due to the step-up in power input. If you were arguing that the delay in the Earth’s response to the increase in power causes overshoot and damped oscillation towards the equilibrium temperature, I would agree with that. Like I said, the units are off. Accounting for residence time of energy in the system would only make sense if the change in energy input was an impulse function. Since the actual change in input is an increase in power (not energy), residence time of energy is not relevant to equilibrium temperature. Nick Stokes’ question seems a fair one. For example, sunlight can do work on a system by photosynthesis. The energy thus retained in the system by production of carbohydrate and oxygen is not measurable by temperature, and could persist for many millennia before their recombination. It’s irrelevant you can track quantum energy movement thru photosynthesis and it was done a part of the proof that QM is involved in photosynthesis. The problem is commentators like Nick don’t have a proper science background to know what you could or could not do yet feel compelled to give a definitive answer. It would seem that the residence time for energy stored by the atmosphere is analogous to a mean free path and/or a time constant. It quantifies how long on average between when a GHG molecule or the liquid and/or solid water in clouds absorbs a photon and when that energy ultimately leaves the planet or is returned to the surface. In general, quantifying the energy flux in and out of the atmosphere is sufficient, although being independent the temporal distribution of the returning flux has definitely confused many alarmists into thinking some sort of amplification is talking place when in fact, the surface is warmer than it would be otherwise because old surface emissions are absorbed by the atmosphere and returned to the surface at a later time. The residence time of LWIR photons whose energy is in the transparent regions of the atmosphere is on the order of 100 microseconds based on the speed of light between the surface and TOA. The residence time of energy absorbed by GHG’s is longer and that of energy absorbed by clouds even longer. The net residence time can be measured at night based on how quickly the surface and atmosphere cools once the Sun sets and/or conversely, how fast they warm as the Sun rises. How can you track “that energy”? It can’t be labelled. Of course it can. In the steady state, the net energy that leaves the planet is equal to the net energy arriving. Since the atmosphere absorbs about 300 W/m^2 of the 390 W/m^2 emitted by the surface consequential to its average temperature (per SB), it leaves only 90 W/m^2 to escape into space. This means that 150 W/m^2 of the 240 W/m^2 that leaves the planet MUST originate from the atmosphere. The only possible source of energy leaving the atmosphere are the surface emissions absorbed by the GHG’s and clouds in the atmosphere, leaving another 150 W/m^2 to be returned to the surface, which when added to the 240 W/m^2 coming from the Sun adds up to the 390 W/m^2 required to offset the surface emissions. There’s nothing more complicated here than Conservation of Energy as constrained by geometry. It really shouldn’t be that hard for you to wrap your head around. You’ll notice that I neglected latent heat and thermals. I’ll add an them if you can articulate the effect that latent heat and thermals plus their return as ‘back radiation’ has on the average temperature and its emissions other than the effect they’re already having on the average temperature and its subsequent emissions. In other words the NET energy leaving the surface is limited to the SB emissions of the surface at its average temperature. You’ve quoted a whole lot of powers. But how do you tag the energy flowing. The claim is of a residence time. How are you going to get a time out of that? As I pointed out, the magnitude of the delay (time) is irrelevant, all that matters is the net energy flux consequential to some finite delay. The only thing important about the delay is that it’s not zero. The consequence of the magnitude of the delay is how long it takes for photons emitted by the surface before the Sun rose in the morning to be returned to the surface and further contribute to GHG warming during the day. I presume that you’re aware that an energy flux in Joules/sec is called Watts and an energy flux density has units of W/m^2. Some of your comments seem to indicate that you may be unaware of the significance of the various units used by climate science and how Joules must be conserved. BTW, if you haven’t figured it out for yourself, the reason the only thing that’s important is that the delay is finite should be clear. It tells us that the reason the surface is warmer then it would be due to the Sun alone is due to the PASSIVE delay between the when the energy of surface emissions is absorbed by GHG’s and clouds and the return of this energy to the surface. In other words, it’s not due to any kind of mechanism that can be modelled as ACTIVE gain driven by feedback, per Bode. It’s not even necessary to invoke the many flaws in the Hansen/Schlesinger mapping of the climate system into the linear feedback amplifier model of Bode to see how inappropriate the powered gain model controlled by feedback really is for modelling the climate system. co2isnoevil, so you’re saying that there’s a factor to add to the steady-state energy balance equation that represents an ‘energy float’? I’m using the term because it kind of sounds like a financial ‘float’, ie, the time between when a bank will receive funds that’s heading towards your account, and when they actually place that money in your account… and the way some institutions can make interest on the interim time period where the money is “nobody’s”? It’s not clear to me what this mechanism is, but you seem to have put a lot of thought into it.. is there a reference somewhere that explains it in physical detail? This is a consequence of the atmospheres finite ability to store energy and the finite rate at which stored energy increases and/or decreases. Note that many seem to conflate the linear relationship between stored energy and temperature with the T^4 relationship between emissions (or total forcing) and temperature. 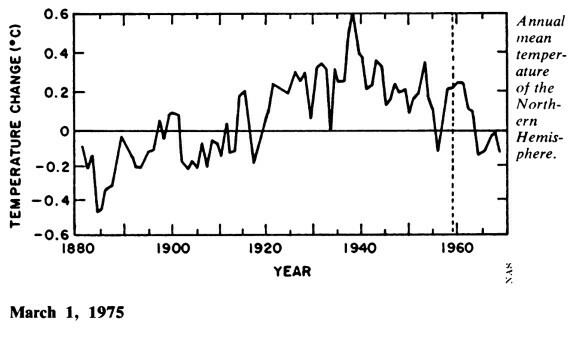 They neglect the fact that as the temperature rises, the sensitivity as defined by the IPCC decreases as 1/T^3. If the atmosphere started out containing no energy, it would take time for the stored energy to build high enough to have enough to return to the surface at a sufficient rate in order to slow down the intrinsic cooling of the surface and reach a new steady state. In the steady state, the atmosphere contains all the energy it can hold and the rate of energy entering it must be equal to the total rate exiting across all directions. The key point is the the delay while the atmosphere heats (or cools) is related to the average delay between when energy enters the atmosphere and when it finds its way out. Relative to the differential equations involved, this is also referred to as a time constant. Insisting that this is something that needs to be ‘tracked’ on a Joule by Joule basis is just plain silly, so don’t be confused by the peanut gallery. Is there a model including this as a factor in deriving surface temperature from first principles? I’m quite familiar with thermal physics and our inability to calculate the earth’s temperature without making heuristic arguments… like “the fraction of IR re-radiated back towards the earth must be X, because then we get the temperature we think we’re measuring as a global average”? If there’s a less-heuristic based model that requires fewer hand waives, that would be compelling to me. Thanks for your explanation. The AVERAGE fraction of IR absorbed by the atmosphere and returned the surface is 1/2 and dictated by geometrical considerations. It’s not just some arbitrary heuristic. Measurements show that monthly averages only fluctuate a percent or so on either side of 50%. This is the unavoidable consequence of a semi-transparent atmosphere with excess degrees of freedom (i.e. variable clouds). Solar energy arrives across a circle the radius of the Earth, but is distributed across a sphere of the same radius which has 4x the area as the circle. This is why we divide solar input by 4 to calculate an average. The same is true with energy absorbed by the atmosphere, most of which originated as surface emissions. It enters from the area of the surface and exits through both the surface and out into space, which combined has twice the area that the energy entered from, hence the 50/50 split. Venus confuses many as it would seem that it doesn’t follow the 50/50 rule. This is because its clouds and not its solid surface is in direct equilibrium with the Sun and the temperature of the surface is dictated by the PVT characteristics of the CO2 ocean between these clouds and the solid surface below, much like the temperature of Earth’s solid surface beneath the deep ocean is dependent on the temperature/pressure/density profile of water.. The significant distinction is that Earth clouds are tightly thermodynamically connected to the surface through the water cycle while Venusian clouds are a thermodynamic system all by themselves. I appreciate you taking the time. The inverted/heuristic logic I observed in typical derivations was for the absorption by the atmosphere of radiation reflected/emitted by the surface, not the fraction of that absorbed radiation that is thereafter emitted either upwards or downwards, which I certainly agree must be close to isotropic (50/50). I’m not terribly familiar with the more advanced modeling, but it hasn’t been clear cut enough, to me, to convince me that the climate industry knows what it’s doing with engineering-quality reliability. The more I interact with scientists on the alarmist side, the more I think that they know exactly what they’re doing and they need to be held to account. I’m more then willing to give them the the benefit of doubt that they are just incompetent, but it’s getting more and more difficult to separate their incompetence from their willingness to deceive, alarm and denigrate anyone who dares to dispute them. Perhaps you can do it the same way you track and label CO2 molecule residence time? CO₂ is labelled isotopically in studies (C14). You can’t do that with energy. If entropy=time, you can derive time from Boltzmann’s equation. Surprise: you cant even measure atmospheric non radioactive energy flux. The thermocouples, thermopiles, pyrometers, and IR measuring tools only measure differences in temperature based on an equation that assumes that the source and target emissivities are exactly equal. These devices are mainly used to measure heat flux through a wall surface. They are not applicable to measuring IR from a gas to a solid or viceversa. Since the emissivities of the source and target are not the same then all measurements of IR in the atmosphere including back radiation IR are bogus. Does this mean that NASA and NOAA have been lying to us for 30 years? Nick showing your QM ignorance again you can mark a photon entangle it. Look up the chinese space entanglement experiments from last year. Yes they did that but there’s no indication in the paper that when that photon is absorbed and emitted in the form of ~20 IR photons that the entanglement still persists. Lets answer that one with a question for you to think about. When an entangled photon passes thru a lense does the same photon leave the lense that entered it? I will give you the more definite answer that any entangled photon you recieve at earth fired from space will have been absorbed and re-emitted many many times. The question of what happened to ones you don’t receive is a little more complex they may or may not be still entangled. I will give you the more definite answer that any entangled photon you recieve at earth fired from space will have been absorbed and re-emitted many many times. Even if those answers were correct they wouldn’t answer the question. One member of an entangled visible photon pair is absorbed at the earth’s surface and about 20 less energetic IR photons are emitted they can’t be entangled with the original photon? Or does the photon that was originally paired with the photon that was absorbed spontaneously become ~20 new entangled photons? They re-emission might or might not end still entangled you have described a complex process. There is no guarantees either way. If we were doing an experiment you would contrive the setup to do what you want. You only do this sort of stuff to measure things. You generally don’t find laser entangled beams in nature and so it is a measuring tool nothing more. But you claimed that this method could be used to determine the energy residence time in this ‘complex process’. I agree with your initial comments but as I have stated above you can track the radiant heat transfer simply entangle the photon .. it is dead simple and done regularly. Variation: as above but this time add at the other end an iron ball heated to 100C and observe whether the various gasses have greater or lesser insulative qualities by ‘storing’ heat or ‘trapping’ radiative heat emitted by the hot object and whether any gas combination delays the transfer to the -100C iron ball . Variation: add water. Does this volatile 3-phase compound expedite heat transfer? Do gas components resist the added heat transfer component? Nick, I can’t believe you’d ask that. Air temperature is directly proportional to its energy content. You have vast amounts of data on your site that show the temperature of the atmosphere is higher today than it was in 1850, which means energy has entered the system and stayed. All of the GCMs claim to be able to calculate the actual rates of exchange of energy among sun, earth, and space, but any rise in temperature corresponds directly to more energy resident in the system. By the way, by “air temperature” I mean the temperature of the gas mixture called “air,” which does not include water vapor. Humid air and dry air at the same temperature contain vastly different amounts of energy. The difference is so large that it makes temperature useless as a sole indicator of the amount of energy in the atmosphere. If you want to determine whether GHG have any effect on atmospheric energy content, you have to plot global air enthalpy (or its anomaly), as determined from a psychrometric chart, versus time. Well, I’ll ask it again. How do you get a “residence time” of energy out of that? What could it even mean? No-one seems to know how it could be done. Nick this seems to be sort of the norm for you, now let give you the benefit of the doubt and say you are doing the stupid head in the sand Stokes defense. On a complex system the residence time will have a distribution you could measure it. When you have a group of students they don’t all get the same mark do they, yet you apply distributions to the result … I HAVE SEEN YOU DO THAT. Your response is as stupid as all the children in the class didn’t get the same mark so you can’t do anything meaningful with the result. So lets stop playing stupid the residence time will have a distribution, whether or not it’s useful is the same as statistics you would run on a class full of student results. Wait until you ever try to use statistics on anything complex with a distribution, I am going to quote this back to you. Actually lets do it back to you Nick what does 2 degree warmer on Earth mean Nick? Both are as stupid or as meaningful as each other. If the Earth’s atmosphere contained no water vapor, then its temperature would simply be proportional to its energy content. If the global average temperature increases, that means the atmosphere contains more energy – virtually all of it provided by incident sunlight. When the global average temperature peaks, then begins to decrease, that time difference between the start of warming and the start of cooling would be the residence time of incoming energy. Seriously, this is the entire argument of AGW proponents. How can you pretend to not get it? A great test case would be Mars, which has no atmospheric water vapor. It also has a nearly 100% CO2 atmosphere, the total mass of which exceeds the CO2 content of Earth’s atmosphere by a factor of 8. Since Mars is smaller than earth, the amount of CO2 per unit surface area is actually 54 times greater than that of Earth. Obtaining a global average temperature record on Mars’ surface could tell us a great deal about what natural forces do to climate. On Earth, we would need to do a time series on global average enthalpy to see if there actually is any warming occurring. Track the residence time of your money. This can be done with balance sheets and income statements. We typically do not label our money. Yet many financial ratios are used. There’s one that has to do with inventory turnover. The point is that the oceans are long term and the atmosphere is short term. An endowment fund is large and long term. That the atmosphere behaves more short term than long term is a reasonable assumption. OK. Who knows the residence time of their money? What’s yours? The coins in your pocket? The value of your house? There is a real issue here. Residence time in a physical system has a caveat. It is only meaningful if the system is (reasonably) well mixed. It is an averaged quantity, and you need homogeneity. You can talk of residence time of water in the air (about ten days). But residence time in the sea makes no sense, because the sea is stratified, and water in the depths stays there for a very long time. My house and IRA money have very low turnover ratios. My job is seasonal. I do income tax returns. So my revenue money has a higher turnover but I will hold some of that money to pay bills for when business is slow. We can call this working capital. If my goals are long term, my working capital is short term. So to apply this to the climate, the working capital is in the atmosphere and the long term stuff is in the oceans. So then I evaluate my success. It is more than my current working capital balance. It is my lifetime of work that is in my house, office building, client base and IRAs. Each point of view has worth. If for 15 years I trim my working capital and invest as much as I can in the long term I’d argue I am in better shape. Assume 92% of the global warming or something is in the oceans. SkS has a plot of that. Whether this 92% really matters to the GMST will depend on how much of it stays there. If we get a long residence time, there isn’t much to worry about. Short and we are in trouble. So, how the oceans handle this makes all the difference. Using financial ratios or residence time ratios will be theoretical or something. It often is not a physical inventory as the cost of that is prohibitive. Consider Antarctica. Put some water there about 500 miles from the coast in the form of ice. It if it stays there for a few years, it’s going to be there a long time. So Antarctica ice has a residence time, and it is approximated. And it uses income statement and balance sheet inputs. I imagine it means the time to reach thermal equilibrium. There are no standard definitions on complex systems you need to create definitions. This article is above my pay grade; All I can do is compare the insulation effects of atmospheric moisture on the coastline on a cold winter’s morning (about 14C) to a location over the range at the same latitude (about -3C). Clearly water has this much effect. But there is another part to this, which is the heat radiating from the earth into the air. The earth itself cools over night to a depth, and warms during the day to a depth. I’m guessing that the earth would cool in both locations at the same rate if the moisture in the atmosphere was the same. So one could conclude there is about 17C difference of air temperature caused by a difference of 40% humidity. GHG’s are such a small fraction of the system, any difference at those scales must be minor by comparison. Models vs data. Hypothesis vs evidence. Data? Evidence? You mean like this?! But, but, but……CO2! Oh, the HUMANITY! Back radiation has been measured since 1953 but there is no proof it slows down the cooling of the land or the water. 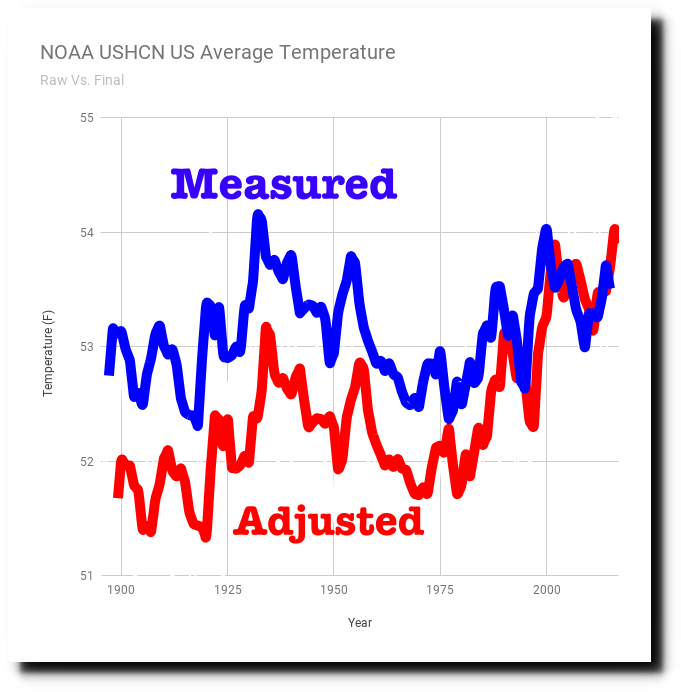 I would like to point out that the graph shown in the article is a fake graph from NOAA that lowered the temps in the 30s and got rid of most of the cooling from the 40’s to the 70’s to make it look like more warming afterwards. I am surprised that no skeptic caught this. For proof see many of Tony Heller’s videos. Yeah it is weird to see a graph that shows today is warmer than the 30s. “back” radiation from the cold troposphere to warm surface violates thermodynamics. Per the suppliers of these IR instruments only “see” about 15 to 25 m. And what “surface” do they measure? Radiation demands a surface! These people don’t know WTF they are doing! SURFRAD claims to measure downwelling IR. What they actually “measure” is a temperature and ASSUME a W/m^2 power flux based on S-B BB 1.0 emissivity. If a .16 emissivity is applied to the dw_ir data it becomes rather apparent that what they are actually measuring is NOT downwelling radiation but another version of the 10 m air temperature. This report was copied to Apogee, Kipp Zonen and Eppley. They have as yet to dispute my observations. But wait, you say, upwelling LWIR power flux is actually measured. IR instruments, e.g. pyrheliometers, radiometers, etc. don’t directly measure power flux. They measure a relative temperature compared to heated/chilled/reference thermistors or thermopiles and INFER a power flux using that comparative temperature and ASSUMING an emissivity of 1.0. The Apogee instrument instruction book actually warns the owner/operator about this potential error noting that ground/surface ε can be less than 1.0. That this warning went unheeded explains why SURFRAD upwelling LWIR with an assumed and uncorrected ε of 1.0 measures TWICE as much upwelling LWIR as incoming ISR, a rather egregious breach of energy conservation. This also explains why USCRN data shows that the IR (SUR_TEMP) parallels the 1.5 m air temperature, (T_HR_AVG) and not the actual ground (SOIL_TEMP_5). The actual ground is warmer than the air temperature with few exceptions, contradicting the RGHE notion that the air warms the ground. So Are you saying that back radiation is impossible and that everyone who was measuring it for 60 years was measuring a fake commodity? Rethinking this, you haven’t proved that back radiation doesn’t exist but you have shown that we can’t measure it. SURFRAD data measures up to twice as much energy as enters from the sun. The graph in the article above shows the NOAA Global Temperature Anomaly for 2010 as +0.8C. From the NOAA site, the Global Temperature Anomaly for 2010 was +0.7C. Last weeks “data” perhaps? It is very hard to keep up with a past that is constantly cooling! Or paraphrasing Leo Tolstoy ‘writing climate models is easy, making them work is the difficult part’. But well obfuscated and this contributes to why climate science remains so controversial. This arises from the definition of forcing which considers an instantaneous W/m^2 increase in solar input to have the same effect as an instantaneous 1 W/m^2 decrease in the size of the transparent window (increased GHG’s). All solar input affects the surface temperature, while only about half of what the atmosphere absorbs takes a similar path to the surface while the other half is ultimately emitted into space. Note that this definition of forcing also obscures the affects of albedo related cooling. The only true forcing influence is the Sun. Just about everything else is a change to the system which can be expressed as an equivalent change in forcing, keeping the system constant. Making forcing incremental is a another part of the deception. Joules are joules and there’s no reason the next Joule of forcing will be any more powerful at warming the surface than the last one, moreover; all Joules contribute equally to the final result. To be fair all the energy budget graphs show 30% of solar being reflected and 19% absorbed by atmosphere and clouds so that only 51% makes it to the surface. The real bust to AGW is that average OLR has not decreased. If the alarmists try to argue that the reason that the OLR has not decreased is because that the sun has increased in last 40 years, there are 2 flaws in that argument. 1) the sun solar strength has not decreased from 1978 to 2003. It has been a neat sine wave. The reason the solar irradiance data is good is that it was a joint venture with the European Space Agency. Nasa cant tamper with the data afterwards because the ESA has a copy . The data that I printed out and graphed went from 1978 to only 2003. I couldnt seem to get data after that from the NASA site. It may be that since they couldnt show a increase in solar radiance to go along with a steady OLR, they werent interested in the experiment anymore and since satellites have only useful lives of ~25 years they didnt want to spend the money on tracking something that couldnt prove their point of AGW. Same thing happened to water vapour stats after 2009. You cant get them because NASA is not interested after they couldnt show an increase with their 1st water vapour satellite. .
2) Even if the solar irradiance had increased, that would be a good argument for the sun causing global warming and not the CO2. 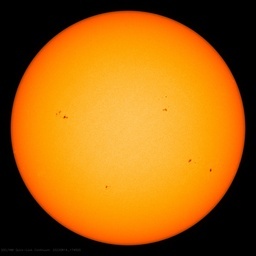 1) the sun solar strength has not increased or decreased from 1978 to 2003. Same thing happened to water vapour stats after 2009. You cant get them because NASA is not interested after they couldnt show an increase with their 1st water vapour satellite. Please explain how you calculated this. The input to the model is the 240 W/m^2 that arrives from the Sun and the output of the model is the surface which emits 390 W/m^2 at its average temperature of about 288K. The ratio between the input and output is, 390/240 = 1.625 which means that each W/m^2 of incident power results in the surface emitting 1.625 W/m^2. The next Wm^2 of forcing can not do any more than this and certainly not the 4.3 W/m^2 claimed by the IPCC in order to support the claimed 0.8C rise from only 1 W/m^2 of forcing. Obsessing about temperature as the ‘approximately’ linear output, rather than the equivalent emissions, is the fundamental obfuscation that hides this otherwise incredibly obvious violation of COE. The IPCC claims are so impossibly wrong, nobody on the alarmist side can believe that ostensibly intelligent scientists can be so incredibly wrong about something so important whose ‘fix’ is so expensive. That they are as wrong as they are contributes to why the science has been so hard to fix. Without sites like this that expose their lies and allow the scientific truth to be revealed, humanity would be completely hosed. Regarding the solar energy absorbed by clouds, relative to any changes in the long term steady state energy balance, this energy is EQUIVALENT to the energy absorbed by the oceans. The reason is the water cycle whose period is far shorter than the periods across which averages are calculated where in the steady state, the energy absorbed by clouds is brought to the surface as weather, rain and radiation. To the extent that some of this energy is radiated by clouds into space, it simply contributes to the energy that must leave anyway in order for the system to be in balance. I think I can explain this better. In the following I will not talk about albedo. I will not talk much about clouds nor much about evaporation nor condensation . They obviously have a major effect on things but we 1st have to examine if you can get warming from the CO2 before considering those 4 things. Since the LWIR travels at the speed of light; when it hits the CO2 molecule it then reemits the photon immediately. That is why you cant heat the air in a room with an infrared heater. You can only heat objects with an infrared heater which in turn will heat the air if they are hot enough. But you have to continuously heat the walls with a lot of infrared before the room air temperature will heat up. It is a very inefficient way of heating air. But efficient to heat a person if you aim the IR heater at them. Of course there are lots of collisions between CO2 and the N2 and O2 gases in the atmosphere but they happen anyway and the temperature does not go up in a room or anywhere else including the atmosphere just because of collisions between air molecules whether the CO2 molecules have LWIR photons in them or not. When the reemitted photon (now traveling with less energy and less than 50% of them since they re radiate in all directions) ) but still at speed of light hits the surface (we know this because back radiation has been measured since 1953), the reemitted photons then get re absorbed by the surface and then get reemitted from that same surface (now with even a smaller an amount of energy) . They then either start the same process all over or else they get emitted to space. Since the amount of CO2 molecules is so small 410 ppm in atmosphere there are not enough of the CO2 molecules to catch all the LWIR photons emitted from the surface. Most estimates put the amount at 8%. So 92% of the LWIR photons from the surface escape to space. and dont forget that even the 8% that are caught by the CO2 have less energy in them than they had in them when they were 1st radiated by the surface. could not have caused any nightime air temperatures to rise. In the present day even with 50% more CO2 the nighttime air temperatures will not rise because LWIR does not heat air (See above). The surface will be a little less cool at night but that is about all and I wouldnt want to try to measure it , the difference will pobably be less than any error factor of the measurements whether it is land or water. Now let us look at this scenario for the daytime or when the sun is shining. Obviously the surface does not get a chance to cool down much until the nighttime, so it is usually getting hotter and hotter during the day. That is why the temperatures are usually the highest around 5 pm. at least in my neck of the woods. Other than that, the same scenario takes place with Mr Photon. The surface is usually always hotter than the air except in deep forested areas where the sun cant get to shine as much. However Mr Photon gets weaker with each bounce between the atmosphere and the surface until he either gets radiated to space or he is so weak that he doesn’t increase the surface temperature at all. In any case Mr Photon never makes the air temperature change. The reason why we have a pseudo greenhouse effect is that the O2 and N2 have energy in them and they make up 99 % of the troposphere. That along with the pressure differential and the lapse rate keeps the planet earth habitable. Oh i will mention one thing about condensation. Every time there is condensation some of the latent heat is released from the water molecules. Not all of it because that water molecule still needs to retain some latent heat if and when it freezes. What happens to the latent heat that is lost during condensation? Well if the water vapour was pulled to higher levels because of convection then it would be lost to space. For the low lying clouds that cause condensation then that heat stays in the atmosphere causing warming. HOWEVER that warming is nothing to do with CO2. That warming from low level clouds condensing along with the O2 and N2 are the real pseudo greenhouse heros. Only an energized CO2 molecule will likely immediately emit a photon upon absorbing another photon or when it collides with a different kind of molecule. An energized molecule may spontaneously emit, but this is a low probability event. State energy can also be exchanged when an energized GHG molecule collides with a ground state molecule of the same gas. Also, photons do not get ‘weaker’ as they bounce between the surface and the atmosphere. Instead, there’s about a 50% probability that a photon absorbed by the atmosphere will be returned to the surface, otherwise, it will eventually escape the planet. Note that the semi-transparent nature of our atmosphere means that this 50/50 split is independent of the density profile of GHG molecules in the atmosphere. I assumed in my previous post that we were talking about CO2 molecules that were energized from the upwelling LWIR. What proof do you have of this? Logically one would assume that any collision of energy with an object molecule will result in some dissipation of that energy. If that was not true then we could set up a perpetual motion machine with having Max Photon and his cousins bounce around between 2 objects forever. I don’t think Max would appreciate that. Photons are quantized in energy which makes the disposition of that energy an all or nothing thing. The energy is in the form of a propagating resonant transfer of energy between electric and magnetic fields, which is a lossless conversion. These periodic fields are either completely absorbed, reflected or unaffected by the electron shells of interacting matter, depending on the energy. The closest thing we can point to that’s like a photon loosing energy is cosmic red shift. By your definition of perpetual motion, superconductors shouldn’t be possible. Note the difference between perpetual motion producing useful energy and the lossless transfer of state energy form one form to another. Consider a pendulum with a magnetic bearing in a vacuum chamber or the Earth in orbit around the Sun. Are either of these examples of perpetual motion? State energy from an absorbed photon can not be directly converted into the translational kinetic energy of gas molecules in motion. Photons emitted or absorbed that are on either side of the primary resonances have some energy converted into or out of rotational states, but this is in equal and opposite amounts , thus there is no NET ‘thermalization’. So I was wrong about the reason that photons lose energy because it isnt that perpetual motion machines are impossible. The real no no is that you cant get more energy out of a system than what you put in. Since the LWIR travels at the speed of light; when it hits the CO2 molecule it then reemits the photon immediately. No it does not, the mean time to re-emit is order of msec for CO2 in the 15𝝁m band. In the lower atmosphere an excited CO2 molecule undergoes about 10 collisions per nanosec with surrounding molecules thereby transferring heat to them. Since the amount of CO2 molecules is so small 410 ppm in atmosphere there are not enough of the CO2 molecules to catch all the LWIR photons emitted from the surface. Most estimates put the amount at 8%. In the center of the CO2 absorption band all of the IR emitted by the surface will be absorbed in a few tens of meters. So 92% of the LWIR photons from the surface escape to space. and dont forget that even the 8% that are caught by the CO2 have less energy in them than they had in them when they were 1st radiated by the surface. Based on quantum mechanics a photon absorbed by a CO2 molecule will have the same energy as it had when it left the surface. Drive by science begets drive by comments. When we are talking on observed data as adjusted; and if observed and model estimates fits closely means the inputs in to the model do not represent real observed condition!!! ”6. If we give solar activity changes 4 times the efficacy of GHG changes then the Energy Balance Model below can be produced. From SB, luminosity we have a 4 coeeficient. Absolutely unclear what that even means. What aerosol, radiative, GHG time series was used in the model? All just hand-waving to me. –”6. If we give solar activity changes 4 times the efficacy of GHG changes then the Energy Balance Model below can be produced. But I add to it. We are in a icebox climate. A icebox climate is cold oceans and polar ice caps. We have had in the distant past, hothouse climates. A hothouse climate is warm oceans and no polar ice caps. Our cold ocean has currently an average temperature of 3.5 C. In last million year our ocean has had an average temperature in the range of about 1 to 5 C.
And in last million years we have been in ice box climate. Or also called an Ice Age. When ocean average temperature is about 10 C, one close to or in a hothouse climate. In our last interglacial period (Eemian) the ocean was warmer then our present ocean and had temperature of about 5 C.
And we of course still had polar ice caps (which btw, are about couple million years old- or they did not melt- as we can find old ice that still exists). So, Eemian, about 130,000 years ago, was warmer and have sea levels + 5 meters higher than present sea level. And if our oceans warmed by 1 C, it would be storing a massive amount of heat. And it would require something 1000 years of ocean having net gain of heat from sunlight. Oh, and our average surface temperature of the ocean is about 17 C and the average surface temperature of our tropical ocean is about 26 C. And the tropical ocean is the heat engine of global temperature. And I would suggest is that it average temperature of entire ocean warms, this allows a higher average ocean surface temperature. Lets just tweak the model to show whatever we want, eh? How do you describe the fact that the black box warms relative to the white or reflective box? I think of it as the energy striking the black box or system remains in that system for a longer period. I really find it hard to understand your problem with this. The black box warms merely because it absorbs more incident energy than the white box. So its temperature must eventually get warmer in a steady state so that its heat loss to surroundings equals the greater amount of heat it absorbs. As simple as that. And Hansen’s “climate response time” has nothing to do with a claimed “energy residence time”. Utter confusion here. The latter concept is quite meaningless, you cannot label and track heat, just count how many goes in or out of system per unit time. Good old Thermodynamics. Thermal photons ? Hilarious ! The “simply” is really funny too, thanks for the entertainment. followed by a decline of only 0.1C over the next three decades to 1970. This was the sharp decline behind the 70’s cooling scare. 0.1C, supposedly. Does anyone believe it? followed by a decline of roughly 0.7C over the next 28 years from 1940 to 1968 — restoring the “average temperature” to what it was in 1920. Future generations will surely be better equipped to measure and report today’s temperature than we can possibly imagine in our primitive, clumsy state. The government haven’t found a way to tax water vapor….. yet. Section 3 describes the tropical tropospheric hotspot which does not exist in the real world. Downwelling infrared cannot warm the ocean surface as all it does is increase evaporation removing the latent heat. You might want to provide a reference for that claim. You need to supply a reference for why you reject the obvious and IPCC AR’s are not proper references as it’s the veracity of these AR’s is what’s being challenged. You can’t use what’s being disputed as the justification for itself. Can you see the circular logic used by the alarmists? Are you really trying to claim that 100% of the surface emissions absorbed by GHG’s in the atmosphere are returned to warm the surface? If you really believe this, then the Earth is in a state of perpetual imbalance of about 150 W/m^2 as this is the amount of energy that must come from the atmosphere in order to achieve balance and the primary source of this energy are those surface emissions absorbed by GHG’s and clouds. I don’t really know what you are talking about. But can you provide the reference for the claim instead? It is a straightforward request. It’s really very simple and the reference you seek is the IPCC definition of forcing. After all, isn’t it your position is that the IPCC summaries of climate science are what you consider authoritatively define what you believe to be legitimate climate science? The IPCC claim is that an instantaneous 1 W/m^2 increase in forcing from the Sun is equivalent to an INSTANTANEOUS 1 W/m^2 decrease in power passing directly from the surface into space, i.e. a decrease in the power passing through the transparent window owing to an instantaneous increase in CO2 concentrations. Upon equilibrium, all of the incident power from the Sun will contribute to the average surface temperature, while only half of the incremental absorption by the atmosphere will while the remaining half is emitted into space. To understand why this must be true, consider the degenerate case of an atmosphere that absorbs 100% of the surface emissions. Nothing will leave the planet to offset any incident energy unless some escapes. Therefore, 1 W/m^2 of solar input and 1 W/m^2 of incremental absorption are different, at least per the IPCC definition, by about a factor of 2. After instructing Harry that the IPCC is not a “proper reference”, your response to Harry’s request is that “the reference you seek is the IPCC definition of forcing”? Thanks, I needed a good laugh to start my day. OK Scott. If you think you’re so smart, why don’t you take a crack at explaining how the energy emitted by the surface at a rate of 4.3 W/m^2 of incremental surface emissions consequential to the claimed 0.8C rise from 1 W/m^2 of forcing is replenished in order to keep the surface from cooling, reducing the magic 0.8C increase? I’ve explained why the IPCC is so wrong about this, so you can try and explain why you think they’re right. Please stick to the actual science. I predict crickets from you, or at most an off topic rant that has nothing whatsoever to do with trying to explain where all this extra energy comes from in order to support the bogus claims of the IPCC. I think co2isnotevil is just comment-bombing. They show very poor manners indeed, and did not even answer my question. I ignore the account most of the time because they will just bung on forever with each new comment getting stranger than the last one. “Are you really trying to claim that 100% of the surface emissions absorbed by GHG’s in the atmosphere are returned to warm the surface?” Wow, that is reading a lot into the short sentence that Harry wrote. I need to brush up on my English (even though it’s my first language) because I just don’t see it in there. It’s not reading in to anything, but just stating a prediction of his hypothesis that simply can’t be true. It’s called the scientific method. Solar radiation penetrates the oceans up to about 100 metres depending on the turbidity and angle of incidence. Mixing is poor, water has a high heat capacity compared with air and the sea holds its temperature. Water is opaque to IR, so DWIR from CO2 molecules can only warm the surface molecules. Collisions with other air molecules are more probable so excited CO2 tends to drive convection, causing the more thermally active molecules to rise to higher altitudes where carbon dioxide and water vapour can radiate their photons to space more readily. The oceans hold most of the heat and therefore control the air temperatures above them. The rotation of the earth, drag effects, turbulence and surface winds lead to an ever changing dynamic heating that contributes much to the random and unpredictable nature of our climate. Solar heating of the oceans is the dominant factor in our climate. Carbon dioxide is a minor player. Given the omni-directional character of DWLWIR, such that the grazing angle is between say 1 and 90 degrees, DWLWIR only penetrates the oceans vertically by around 4 microns. The top micron layer of the ocean is cooler than the ocean below (because of evaporative cooling) such that the energy flux is upwards such that energy from absorbed DWLWIR in the top 4 microns cannot be conducted downwards, ie., against the direction of energy flow. Ocean overturning is a diurnal event, not one happening 24/7 and is a slow mechanical process, so too the action of swell, waves and wind. There appears to be no effective mechanism by which DWLWIR absorbed in the top 4 microns can heat the oceans. CO2 is not the control knob, though it and mostly water vapor probably has a warming effect. I think a doubling of CO2 causes 0 to .5 C.
The control knob is the average temperature of entire ocean. And the entire ocean temperature is cold. And cold oceans are icebox climates. As you say CO2 does not appear to have much effect upon the ocean or the ocean surface. And any effect should less than the effect of water vapor and don’t think even water vapor has much radiant effect upon the surface of ocean. It seems to me, that oceans cause increase in global average temperature and land surfaces cause global cooling. Or if Earth was completely cover by ocean, it would result in a higher average temperature. And if instead Earth was completely covered by land, Earth would have much lower average temperature. Earth ocean surface temperature has average of 17 C and average land is 10 C.
Some of difference is due to location of land. But the ocean warms the land, ie, Gulf Stream warms Europe. And land does not do much in terms of warming the ocean. So I would say if ocean completely covered world, the average ocean surface would be warmer than 17 C – or average global temperature of 20 C (or more). And if instead completely covered by land, average global temperature would less than 10 C. Less than 10 C even if somehow had same greenhouse gas effect. And if doubled the greenhouse effect of gases, it still would not get warmer than 10 C.
Water is opaque to IR, so DWIR from CO2 molecules can only warm the surface molecules. DWIR warming is mainly confined to the atmosphere where kinetic energy transfer via collisions with other air molecules is more probable than photon emission. The warmed air molecules rise to higher altitudes by convection where subsequent radiation to space via water vapour and carbon dioxide takes place. I agree with Bob Irvine that the observation that CO₂ increase is producing much less warming than expected from the most commonly accepted hypothesis deserves an explanation. His explanation of differences in energy residence time is certainly a possibility, but there are others. My favorite one currently is that the energetics of the climate system is dominated by the temperature latitudinal gradient as the most important factor determining how much energy is lost at the poles. Despite claims that CO₂ produces polar amplification, its effect appears to be more global and dampened by H₂O changes of state and convection. Solar irradiation, however, affects the gradient at multiple levels, from the stratosphere to the subsurface ocean, and thus is a lot more effective at changing the gradient and affecting climate. No it does not. The CBR (Cosmic Background Radiation) can be observed from any direction in the sky. Also your understanding of “back radiation” is flawed. It does not violate the laws of thermodynamics because it does not “heat” the surface. It retards cooling, which is a different thing. The subtlety being that it retards cooling by recycling surface emissions absorbed by GHG’s and clouds back to the surface at a later time. A perceptual error arises by considering the returned energy to be new warming energy as its consequence is to make the surface warmer than it would be based on the incident solar energy alone. The author should really submit this to a learned journal for publication. The quoted finding implies a temperature of = 140 K, or about 45 K below the liquefaction point of ethane. This is much colder than the IPCC has been leading us to believe. The units of the expression you cite are not degrees, but degrees per cubed root of W/m^2. Congratulations. You finally got something right. Yes, I did indeed leave the W/m^2 out of the expression. But the point remains. For all we can tell from the head post, the author is a Monckton without the flashy graphics and Latin: the post is full of latent ambiguities, so people who don’t understand it blame themselves even though the problem is actually that the post is unintelligible. The excerpt I quoted, for example, seems to imply an impossibly low temperature. Maybe he meant something else, but he didn’t show his work, so we have no way to dispel the ambiguities. This site’s look-what-stupid-thing-alarmists-said-now pieces are all well and good, I suppose, but the ostensibly technical posts could use a little quality control. Well, quality control isn’t a strong point of consensus climate science anyway. Based on the crap that gets through pal review, quality control aspects like repeatability, testability and conformance to first principles physics are at the bottom of the list of requirements. In fact, these aspects must be completely ignored, otherwise, they can have no foundation to support their claims. I should also point out that everything I’ve said is based on testable and repeatable science, so your not so subtle jab at me only illustrates your ignorance about what is and what is not science. BTW, its not just the W/m^2 you omitted from the expression, but that the meaningless metric you computed has units of degrees K per the CUBED ROOT of W/m^2. [I]ts not just the W/m^2 you omitted from the expression, but that the meaningless metric you computed has units of degrees K per the CUBED ROOT of W/m^2. My bad. I had thought you’d finally gotten something right. A triumph of hope over experience. What I did was leave W/m^2 out from kelvins per W/m^2 in the units for the 1.4 (which I erroneously remembered as 1.6). Yes, I know that you left the W/m^2 off of the 1.4K and that makes the result the temperature at which the sensitivity is 1.4K, which does have meaning, but of course a sensitivity of 1.4K per W/m^2 is far larger than even the IPCC can arm wave and obviously impossible. This doesn’t negate the authors findings, only that the stated sensitivity for CO2 ‘forcing’ is too large to begin with. The author seemed to be saying that in order to incrementally fit a simple model to the data, the sensitivity to solar forcing had to be much larger than the sensitivity to the forcing from increased CO2 (decreased size of the transparent window). I will say that his factor of 4 is wrong and its only a factor of two, but his baseline for CO2 at 0.35 per W/m^2 starts out 2 times to big based on the IPCC’s definition of forcing which incorrectly equates a change in solar input to a change in power absorbed by the atmosphere. His numbers may be flaky, but the idea that the IPCC overstates the effects of GHG’s relative to equivalent solar forcing is definitely true. The author just recast this as underestimating the effect of solar input. You said you were a retired lawyer, so lets move on to something in you area of expertise. Can you explain why the conflict of interest at the IPCC is so easily accepted by the consensus and the political left? In case you’re unaware, consensus climate science is defined by what’s summarized in IPCC reports, yet the IPCC requires a large anthropogenic effect in order to justify both its continued existence and the transparent agenda of the UNFCCC to redistribute wealth from the developed world to the developing world under the guise of climate reparations. More nefariously, the IPCC as part of its founding, positioned itself as the arbiter of what is and what is not climate science with this specific goal in mind. Isn’t there a crime here? Especially given the dollar amounts involved. What exactly are you suggesting the 147K value you’ve calculated using a dT of 1.4K (or perhaps 1.6K) represents, Joe? My understanding was that Joe looked at the solar forcing sensitivity the author determined was required in order to achieve the correct shape of an otherwise accepted anomaly plot, while at the same time being consistent with the stated CO2 forcing sensitivity. Joe then backed out the temperature (147K) where the sensitivity would be matched to the requirement and that the resulting low temperature seemed to indicate a flaw in the authors analysis. What it seems to me the author did was increase the solar sensitivity, rather than decrease the CO2 sensitivity, not so much to show what the right answer is, but to illustrate that there’s definitely something wrong with the consensus analysis and that assuming a delta flux at TOA always has the the same effect, independent of its origin, is incorrect. This ties in to the claim I make over and over again, which is that this kind of error is intrinsic to the IPCC’s flawed definition of forcing. I agree there are a number of possibilities or explanations. I was really looking for reasons why CO2 could produce significantly less warming than a similar amount of solar forcing. Your idea is another possible explanation and equally as likely. There are likely to be others as well. I don’t think you realise how difficult it was to find a combination of forcings and efficacies that actually fitted the measured temperature. No other model that I’m aware of can actually track the 20th century and produce the 21st century hiatus as well. There was only one solution that I could find and it happened to be that solar forcing had 4 times the efficacy of CO2 forcing. The model certainly was not simply picked out of the air and could not be tweaked to what ever suited. For this reason this model should be interesting. As Javier pointed out, there are also a number of physical explanations that support this model and this should also add to that interest. Is it true that, on a cold day, putting on a sweater will keep you warmer for as long as you keep the sweater on? Residence time is a simple idea (I called it “length of stay over at UAH). Place one bean per second into a bowl. If the average residence time for each bean is 10 seconds, then beans will be entering, but not leaving, for ten seconds. After that a bean will leave every second, same as entry rate, and no more will accumulate. “average residence time” – so some could leave immediately, some after 10 seconds, some after 20 seconds? But you could tag the beans and measure a residence time for each, then calculate the average. For an irradiated object, you can’t tag photons as they enter and check them as they leave. What if, when you start your bean experiment the bowl already has a thousand beans that have been sitting there for 10 minutes before you came along? How would that affect your observations? What if those thousand beans had been there for 10 years before you came along? Did average residence time make a difference? Regardless of whether you can define residence time of energy in a meaningful, measurable way, it is superfluous in determining energy balance. You have not provided an average rate of input or residence time for those 1000 beans. I would have to consider them “permanent fixtures”…… they would just get added to whatever equilibrium value is calculated among the beans that are coming and going. Tolstoy! You magnificent b______! I read your book! The answer to 1 is no. Materials we see as black and white have similar infrared spectra, unless we’re talking about some exotic materials, perhaps known to JPL or NASA but not to me. They are almost equally efficient radiators. But if the energy source is sunlight (mostly visible and UV light) then one is an efficient absorber while the other is not. Each will achieve equilibrium when it reaches a temperature at which the absorbed radiation is equal to the emitted radiation. For the black object (efficient absorber), the equilibrium temperature is higher than for the white object. Residence time has nothing to do with that. In the bean example, rate of input is the other variable that will determine how many beans will accumulate in the bowl. If we keep the average residence time at 10 seconds, but instead put 2 beans/second into the bowl, then in the 10 second time frame that no beans left, 20 will have entered. A black box absorbs photons at a faster rate than a white box. A “thermal photon” is a photon drawn from such radiation. They are different only in their statistical properties from photons emitted by atomic excitation, or fluorescence, or from coherent sources like lasers. You can identify the source of a spectrum of photons as a thermal source or some other type, but you can’t do that with any individual photon. Anybody who asks the question “What is the residence time of energy?” does not know what energy is. Energy has the units Kilogram*meters squared/seconds squared. There is no residence time. The atmosphere radiates energy to space. CO2 at the TOA retards this, which means more energy is still in the atmosphere with more CO2. If anyone could calculate the magnitude of this effect we could all quit worrying about CO2. No one ever has. Radiation absorbed by a 5′ deep swimming pool gets converted to internal energy. A portion of that energy gets conducted downwards. That takes time, during which more radiation is absorbed. The longer that energy spends in “downwards or sideways conduction” (for lack of a better term), the greater its residence time. If the pool were instead 10′ deep for example, average residence time would be greater because it would take longer for heat to be conducted to that greater depth. The greater residence time (given similar rate of input) leads to more internal energy at equilibrium. I’m sorry, What? Where is this radiation coming from? The water is radiating too, as is the pool, and First and Second Laws apply as always. Are you trying to help me understand something about which you yourself are completely clueless? Sorry, I was imagining an outdoor pool, so it receives radiation from the sun and atmosphere. Of course the pool is radiating too. That counts as output. Energy within the pool, radiating or being conducted downwards or sideways, (anywhere but out of the system) does NOT count as output. That’s the point. In a steady state, a planet would radiate energy to space at the same rate…..with or without CO2 (given a similar albedo). On the other hand, the energy’s residence time is greater with CO2 than without, which corresponds to the higher temperature. Whether or not it’s useful or not is a whole other question and depends on how you want to define it. There certainly not an off the shelf science definition for it’s use in this situation but it would be possible to make one and you would then get the get a residence time distribution (which is why you do this stuff). Basic residence time theory treats a system with an input and an output, both of which have flow only in one direction. The system is homogeneous and the substance that is flowing through is conserved (neither created nor destroyed). I do believe that model match what Climate Science calls a CO2 forcing, does it not? It is a simplistic model, I am not disputing but I can’t see it is any better or worse than what climate science already does and much rolls on what definitions are given. Thanks for that. I’ve never actually read about “residence time” before. As mentioned, I thought of it as “length if stay”. Originally, I Imagined a line of people running from one end of a football field to the other. If they left one at a time, at a constant rate, then the slower their velocity the more runners would accumulate on the field. That’s because their “length of stay” had increased. Conversely, if they traveled at the speed of light, each runner would traverse the length of the field in a fraction of a second. So if one runner left each second, most of the time the field would be completely empty. Very short length of stay. Like you said, it’s a simple way of understanding some of the concepts in climate science. Probably not useful other than that. Some technical corrections might be useful. W (watts) isn’t a measure of energy, it is a measure of power (energy per unit time). Heat capacity is the factor that allows use to convert a change in energy (not power) to a change in temperature. W/m2 is (J/s)/m2. Heat capacity is (J/m3)/K. Dividing the former by the latter gives us (K/s)/m, a warming rate which depends on the depth (m) of the material using warmed. In the case of the Earth, that is the depth of the ocean being warmed – which depends on the how long a period you are concerned with. The large changes in SWR associated with the seasons produce average temperature change at 50 m. In other words, you can think of the ocean as a slab of water that undergoes uniformer warming and cooling down to 50 m – the “mixed layer”, the ocean and atmosphere warm up about the same amount seasonally because the ocean is mixed by waves and the atmosphere by winds. All SWR (and DLR) are absorbed by the mixed layer of the ocean, so it doesn’t take a 1000 years to either return to the surface. There is a slow overturning that links the mixed layer and the deeper ocean that requires 1000 years, but the mixed layer equilibrates with the surface and atmosphere first. So forcing by GHGs and forcing by the sun will have exactly the same effect per W/m2. So (W/m2 divided by heat capacity) times the depth of the mixed layer gives us a warming rate K/s – which appears to increase forever. However, the Earth radiates more to space as it warms. We talk about both radiative forcing and radiative imbalance (across the TOA) in terms of W/m2. Forcing is something that PERMANENTLY perturbs the flux across the TOA (rising GHGs or increased solar output), but the radiative imbalance drops as the planet warms in response to a forcing. A sudden 1 W/m2 forcing initially causes a 1 W/m2 radiative imbalance that gradually decreases with time as equilibrium is approached. Technically, we integrate this decreasing warming rate (from t = 0 to t = infinity) to get equilibrium warming. Bob wrote: “This implies that GHG energy is returned to the atmosphere and space very quickly as latent heat of evaporation while solar energy is effectively absorbed to a depth of many meters with consequent delays in equilibrium at the Top of the Atmosphere (TOA).” It’s apparently too obvious. We can’t conduct an experiment that proves that the forcing from SWR and GHG’s/DLR produces the same amount of warming. There are no observations that contradict the idea that forcing from GHGs causes warming. Theory tells us only how much warming would occur AT EQUILIBRIUM in the ABSENCE OF FEEDBACKS. That is about 1.15 K per 3.7 W or or 0.31 K/(W/m2). Based on observations (energy balance models), we have observed 0.36 K/(W/m2) of transient (not equilibrium) warming. If we correct for the amount of heat still flowing into the ocean we can calculate we will observe warming of about 0.5 K/(W/m2) at equilibrium. Feedbacks are a perfectly fine explanation for the observed difference between 0.31 and 0.5 K/(W/m2). CERES shows us unambiguously that the planet emits 2.2 W/m2 more LWR per degK of seasonal warming or 0.45 K/(W/m2), not the 0.31 K/(W/m2) that would be expected if feedbacks did’t exist. Since the seasonal change in mean global temperature (not temperature anomaly) is 3.5 K and the change in LWR emission is about 8 W/m2 instead of about the 11 W/m2 we expect without feedbacks, we can be sure positive feedbacks exist. So there is no contradiction between GHG theory and observation. There is a debate whether observations (EBMs) or AOGCMs product the best estimate of climate sensitivity. Even if there were a contradiction, you also need to remember that there is a massive reservoir of cold water at the bottom of the ocean that is slowing overturning. If that rate of overturning speeds up, it will get colder. If it slows down, it will get warmer. And the fluid flow in such ocean currents is chaotic and changes without any apparent cause. Temperature change without any change in energy flux across the TOA! For this reason, this is called “unforced variability”. In the Pacific, cold water upwells off the coast of South America, warms as it crosses the Pacific and is buried in the Western Pacific Warm Pool. When this process slows or reverses, the Eastern Pacific is much warmer than usual and we experience an El Nino. Unforced variability. Temperatures around the Atlantic Ocean seems to collectively vary (the AMO), possibly due to chaotic fluctuations the Gulf Stream (or MOC). Also unforced variability. It isn’t clear whether we have identified enough reduction in solar output and volcanic aerosol to explain the LIA, so it also could represent a chaotic fluctuation in our climate. Chaos and unforced variability make our planet an lousy place to for conduct useful experiments about the relationship between forcing and temperature. We learn about the relationship between GHGs and forcing in the laboratory. When forcing produces a radiative imbalance across the TOA, conservation of energy demands a gradual change in temperature. Uncertainty about feedbacks (temperature dependent changes that also change the flux across the TOA) and the rate at which surface temperature changes penetrate the deep ocean AND chaos all make it impossible to prove that theories about GHGs are wrong by observing the earth.